India’s digitalisation roadmap is expected to catapult its digital economy to 1 trillion USD by 2025. India is witnessing an unforeseen digital transformation, and at the same time, a rapid rate of urbanisation. The Government of India’s 100 Smart Cities Mission blends these digitalisation and urbanisation waves, and endeavours to accomplish urban renewal through a Pan-City Smart Solutions initiative, and technology-enabled ‘city improvement (retrofitting), city renewal (redevelopment) and city extension (greenfield development)’. While the smart city initiative focuses on sustainable development of our cities and harnessing digital technologies for integrated citizen service delivery, it demands a strong focus on cyber security. It is imperative for stakeholders to review and make efforts towards ensuring the safety, security and privacy of citizens and enhancing our cities’ capability to mitigate cyber security risks. Recognising cyber security as a key priority, the Ministry of Housing and Urban Affairs (MoHUA) published the ‘Cyber Security Framework for Smart Cities’ on 20 May 2016 and issued an advisory to all smart cities to drive conformance to this framework. 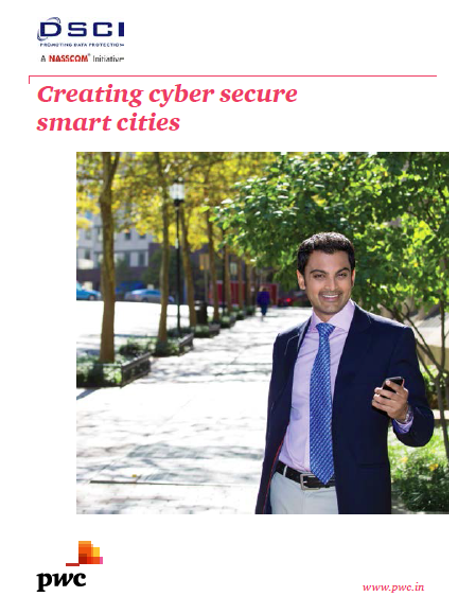 This report on ‘Creating cyber secure smart cities’, jointly developed by DSCI and PwC, is an attempt to reinforce the attention that smart city administrators need to give to cyber security in all their projects while incorporating smart solutions. The report acknowledges that cyber security is the combined responsibility of various stakeholders. 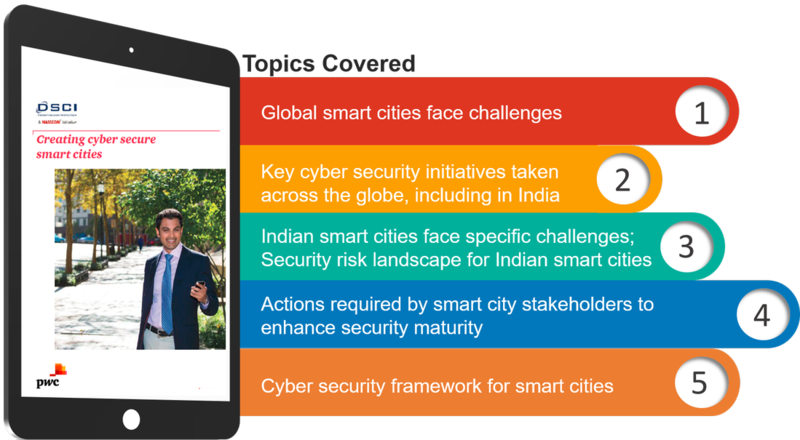 With a fine blend of global and Indian instances, this report serves as a preliminary guide for smart city stakeholders to understand the risks and steps that need to be taken to enhance the cyber security posture of smart cities. There is no security organisation responsible for ensuring cyber security within smart cities. Additionally, there is no or limited consideration of cyber security during the various phases of smart city development. Limited budget is allocated for cyber security in the overall smart city budget. Even when a budget is allocated, it does not match the risk profile of smart cities, thereby making the process of setting up adequate defences a difficult proposition. Business-driven risk assessments are not conducted to identify appropriate security products based on the risk profile of the smart city. Additionally, there are no baseline security guidelines for implementation and configuration of security products. Smart city stakeholders have low awareness of cyber security risks and vulnerabilities. Further, the stakeholders responsible for securing the smart cities, have limited cyber security capabilities. There is no mechanism in place to regularly perform security assessments of the smart city set-up in order to identify and mitigate security risks on a continual basis.